Welcome to the most widely recognised Agile training programme. This has been offered by Scrum WithStyle for over 10 years! There are many imitators but this is the original Scrum certification course with accreditation from the most influential professional development body – Scrum Alliance. 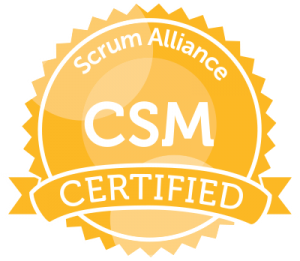 Founded in 2001, Scrum Alliance is the most established and influential professional membership and certification organisation in the Agile community. Certified ScrumMaster is the right choice if you want to understand what good Scrum is and how you can play your part in the Scrum game effectively. Also to prepare you to take your first steps into the challenging but very rewarding role of ScrumMaster. Our Certified ScrumMaster (CSM) course is an intensive deep dive into the world’s most popular Agile method: Scrum. It is an immersive learning experience emphasising hands-on participation through a mix of interactive seminars, group discussions, team activities, games and role-plays. Practical guidance from first-hand experience. Over a decade implementing Scrum in dozens of organisations means that Rowan’s guidance is grounded in real world challenges and is highly practical. He speaks from first-hand experience, having worked for years in each of the Scrum roles including ScrumMaster, Product Owner and Development Team Member as well as in a wide variety of other technical, leadership and coaching roles. Insightful and inspiring. As past course participants testify, you can expect to take away many deep insights into the nature of Scrum and its potential to transform your organisation and your work life for the better. Stories of what others have achieved with Scrum are likely to inspire you to be a game changer yourself. Authoritative, non-proprietary material. Unlike many other training providers who teach proprietary, non peer-reviewed method formulations marketed using the generic umbrella term ‘Agile’, Rowan’s teaching is fully aligned with the authoritative definitions of the most widely used and peer-reviewed Agile frameworks (e.g. Scrum as per the definition endorsed by the Scrum Alliance®) and techniques (e.g. User Stories and Story Point Estimation as per Mike Cohn). Take away a comprehensive workbook. As a course participant you will receive a comprehensive course workbook including worksheets on key topics, detailed information on the Scrum Roles not found elsewhere, recommended reading and further resources to assist you post-course. Post-course follow-up. Rowan can provide post-training coaching and has done so with a wide range of organisations in industries including banking, federal and state governments, health insurance, superannuation, salary packing, retail, manufacturing, building security, information security and media.